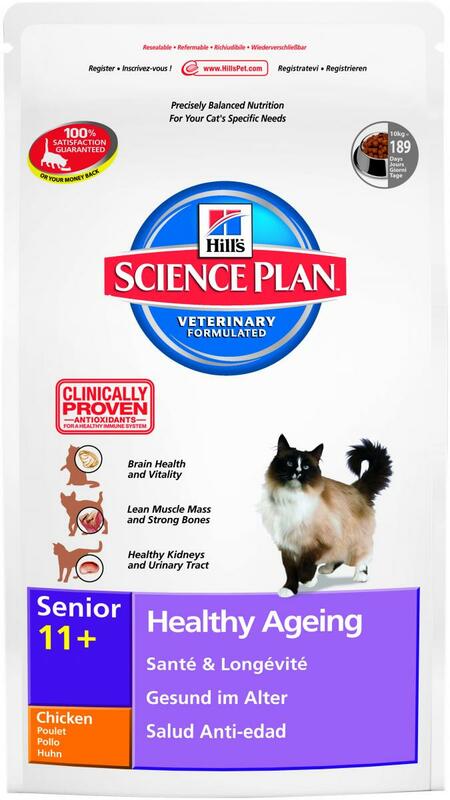 Science Plan™ Feline Senior 11+ Healthy Ageing is a complete pet food for the older cat from 11 years old. It provides a precise nutritional balance of energy, protein, vitamins and minerals, with L-carnitine for lean muscle mass. No added artificial preservatives, flavours or colours. Cinically proven antioxidants and omega 3s to help support healthy brain and vitality. Clinically proven L-carnitine and optimal levels of calcium for lean muscles and strong bones. Controlled levels of minerals for optimal kidney and urinary tract health. Ingredients: Chicken: Chicken (35%) and turkey meal, wheat, maize, maize gluten meal, animal fat, brewers' rice, digest, minerals, fish oil, flaxseed, soybean oil, L-carnitine, taurine, vitamins, trace elements and beta-carotene. With a natural antioxidant (mixed tocopherols). - Chicken: Chicken (28%), pork, maize starch, wheat flour, various sugars, pea protein, dried whole egg, cellulose, minerals, sunflower oil, dried pork protein, fish oil, vitamins, trace elements, taurine and beta-carotene. Coloured with natural caramel. - Salmon: Chicken, pork, salmon (4%), maize starch, wheat flour, pea protein, various sugars, dried whole egg, cellulose, minerals, dried pork protein, sunflower oil, fish oil, vitamins, trace elements, taurine and beta-carotene. Coloured with natural caramel. Mature adult cats from 11 years old. Below are some recent questions we've received regarding Hills Science Plan Healthy Ageing 11+ Cat Food, including answers from our team. Is the omega 3 and 6 content enough for dry skin? Our vet doesn't sell Hills Science Plan 11+ for cats so have always bought the senior/7+ for our cat (male); a rescue cat guessed to be 12 yrs old by vet. She advised a supplement of omega 3 and 6 for his dry skin (not hugely dry; and fur is very silky) but I am wondering if there would be an improvement if I switch to the 11+ Science plan dry biscuits without the supplement. Unless your cat has an unusually high requirement for these oils, this Hills diet should contain adequate levels. I would suggest trying the diet just as it is. If you notice any change in the skin then it is possible to add supplements to it, but this is not usually necessary. Changing the rest of the diet can alter the overall balance of many things and supplements which were previously of benefit, might not now be needed.